I got cast in my first co-star role as Nygma's Assistant in Gotham Very exciting to get to work with Corey Michael Smith and Robin Lord Taylor!!! Crossing my fingers they bring me back to do some more of Penguin's dirty work. Watch the clip here. The Jim Gaffigan Show's season 2 premieres on father's day and I got to be in the promo! Twisted Business is back in production. We recently wrapped shooting episode one and are moving full force into post!!! Yo, check out that Key-tar player... I booked my first commercial! I've written a web series based on my life as a birthday clown and I'm finally ready to share the pilot with the world. It's called Twisted Business. Check it out!! I had my first print/body double job for A&E Networks The Returned. It was a fun filled two day shoot with water filled coffins, hair extensions, and multiple costume changes. In the end, they chose the shots of just my legs! Go figure. 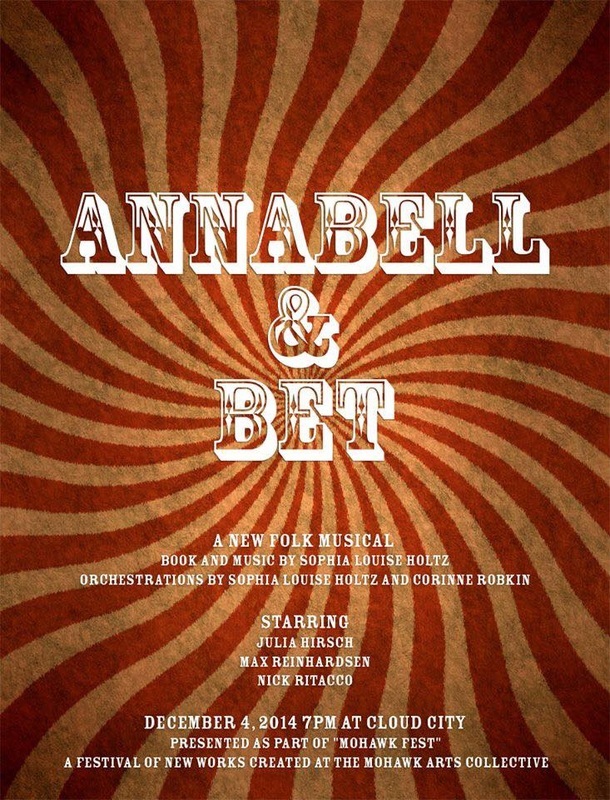 My friend Sophia Louis Holtz and I are continuing to work on the music for a musical she's writing called "Annabell & Bet". Back in early December we performed some new arrangements for the Mohawk Fest at Cloud City. Sophia and I are also gigging around New York City playing both original music (not associated with the musical) and covers. The Red Gloves crew has reunited and is currently rehearsing for a film version of the performance we did at the Irondale back in May. Were shooting a 25 minute film on a rooftop in ONE SHOT! 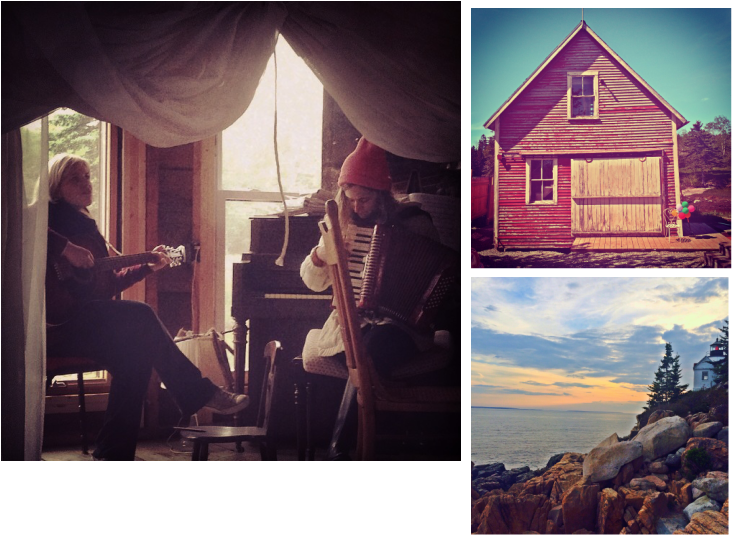 In June I attended an arts residency at Mohawk Arts Collective in Bass Harbor, ME, to workshop music for a new musical loosely based on the fairy tale Beauty and the Beast. "With the simplicity of a graphic storybook for children, The Red Gloves uses hand movement as a springboard into a theatrical celebration of the contradictions, poetry and camaraderie in our day-to-day lives"
Story and Concept by Genevieve Leloup, and Billy Schultz. The Ensemble: Ariane Bernier, Becca Bernard, Cassandra Burrows, Corinne Robkin, Erica Lan, Hannah LaBronte, Kareem Woods, Marcos Duran, Mia Crivello, WT McRae. I'll be singing and playing the accordion!!!! Happy In NYC February 2014. I was lucky to take part in Geoffrey Stevens project "Happy in New York" that is inspired by Pharrell and We Are L.A.'s video "Happy". It was really windy and rainy but it was fun to dance on one of my neighborhood blocks in Ridgewood, Queens. You can view the video here. ﻿Ivory Shadows and The Prisoner February 2014. I recently acted in my first two student films. The Prisoner was a New York Film Academy short, in which I played Leah, the sister of Damien, who was recently released from prison and has to deal with some old ghosts. I was also a piano playing" body double for one of the leads in the SVA Thesis Film, Ivory Shadows. I had to learn a Chopin nocturne in 2 days! All you'll see is my bloody hands. First time in fake blood! I was grateful for the opportunity the spend some time with my old friend, the piano. A lot of people don't know that I used to be a pretty serious piano player, but I gave it up about 15 years ago. It's amazing how your body maintains the muscle memory. The.Humanest, directed by Peter Musante. Incubator Arts Project, Novemeber 2013. The life and legacy of enigmatic mathematician, code-breaker and pioneer of artificial intelligence Alan Turing provoke a multidisciplinary examination of the paradoxical, often binary, relationship between authenticity & performance. The theater is transformed into the site of a unique form of Turing Test (which tests a computer’s ability to convincingly imitate human intelligence) where audience become judges and six participants compete over three rounds of “conversation” that invoke Turing’s story. Driven by the participants’ individual quests for aliveness on stage, “the.humanest” pairs a variety of performance strategies with the niche pageantry of competitions such as the coveted Loebner Prize for Artificial Intelligence for a wholly original theatrical experiment that playfully interrogates what it means to be human.